'Ocean's 16' Powerball Winners Claim Share Of Jackpot : The Two-Way The winners of a third of the Powerball lottery call themselves "Ocean's 16." They famously showed up for work at the Ocean County Vehicle Maintenance Department after realizing they were about to become millionaires. 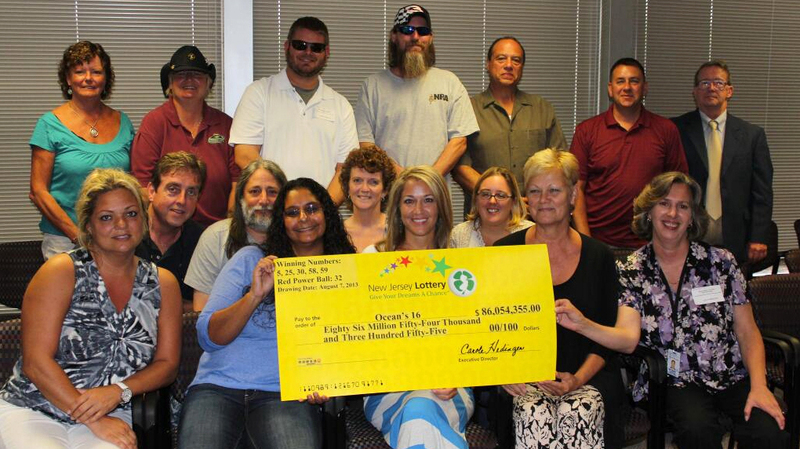 The winners of the Aug. 7 Powerball jackpot pose with a check for their share of the $448 million grand prize. The 16 women and men who won more than $86 million in last week's Powerball drawing validated their ticket and posed with a gigantic check Monday. The group, which calls itself "Ocean's 16," famously worked at the Ocean County Vehicle Maintenance Department the day after they learned they would become millionaires. "Lottery officials say each will get about $3.8 million after taxes," the AP reports. One member of the group is Sue Nickel, who told NBC 40 in South Jersey over the weekend that she'll use the money to help her family recover from the damage wrought by Hurricane Sandy. "It was just devastating, we had seven feet of water, and we cleaned out a lot of stuff," Nickel says. "We're starting to regain, but this money will really help us redo what we need to do." Nickel says she'll continue to work for another year or so. NBC 40 reports that her son returned home from the Air Force Friday. Three tickets were sold for the $448 million jackpot, including two in New Jersey. Another winning ticket was sold in Minnesota, where Paul White of Ham Lake last week claimed his third of the jackpot — $149.4 million — in an immediate cash option of $86 million. The group of New Jersey lottery winners appeared at a news conference at the Ocean County Library in Toms River Monday afternoon. The holder of the third winning ticket has not come forward.